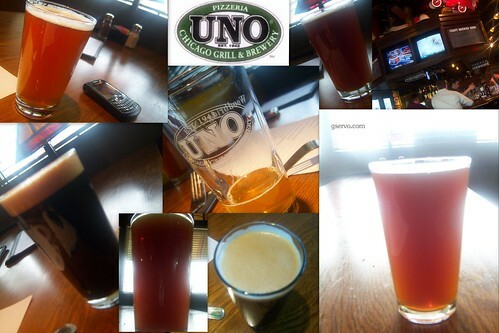 Uno Chicago Grill in Metuchen, NJ had their second ever cask event on Saturday, March 28th, 2009. It was a pay as you go event hosted by Brew Master Mike Sella and staff . The event was a good one. The beers I had from the list were pretty decent. Smaller scale events like are very good. It was a pay-per-glass event and everything was at a great price point. The head brewer took a minute to talk to us, and when we had questions about what we were drinking. It was a great event, a nice event to start off the spring. This was a style of event I would definitely like to do again . “You must try everything once to discover what you want to try again.” But I only tasted 5 beers at the event. The first beer I had was the Yards Brawler(oak aged). It was a ruby mild with low alcohol, aged with oak chip and dry hopped. It had a decent smoked, woody body . The second beer was by Uno’s. It was the Station House Red and it was a session beer and that you had to let work. It had fruity notes, but it was also dry hopped. That added an extra dimension to it. I got to try the beer as it’s normally served also, much better casked. The third beer I had the Captain Lawrence Smoked Porter. It was a stoutish dark chocolate porter with coffee hint, but lacked unique flavor. It was a good example of the style but did not have any individuality to it. The fourth beer I had was the Yards Philly Pale Ale (dry hopped). There were apricot flavors that smacked you around. It was a very fruity example that I re-dubbed ‘Fruity Pal Ale” or “FPA.” I also had a little of the Sly Fox Phoenix Pale Ale it was a light and fruity ale. It would make a nice summer beer. Cask Climax Helles The Hoffmann Helles (pronounced Hell-es), which is German for “bright” is a pleasant and easy to drink summer beer with a bready/grainy taste. Cask Sly Fox Phoenix pale ale American Pale Ale brewed with Pale and Crystal malts and hopped with Centennial and Cascade hops from the Pacific Northwest. Copper in color, medium-bodied and spicy. Cask Yards Brawler (oak aged) crafted in the style of English session ales. Cask Yards Philly Pale Ale (dry hopped) Brewed with pilsner malt.